With the everpresent attention to global warming and the human impact of increased greenhouse gasses, energy efficiency and conservation are hot topics in the media and on a more grassroots level. 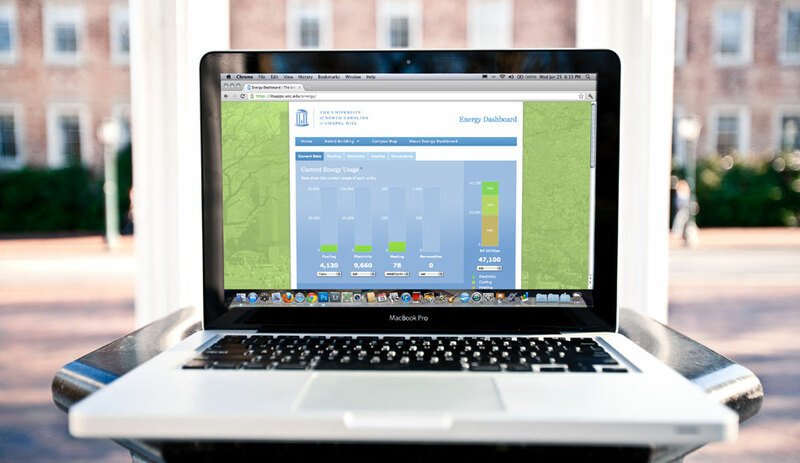 As a large consumer of energy with an expansive campus, the University of North Carolina at Chapel Hill's energy department wanted to learn more about energy use campus-wide, with a goal of improving efficiency. As part of the initiative, the university installed sensors in all the buildings across campus, providing real-time data with which to analyze trends, set goals, and potentially decrease energy use. New Media Campaigns designed a web application that allows the public sharing of the important collected data, for use by both the university and the general public. The dashboard currently features real-time data for steam, electricity, and chilled water, and a wealth of other information is available at monthly or annual intervals. Scalable from the global (campuswide) to the local (individual buildings), the custom graphs are also customizable by time interval. In addition to these powerful data tools, the dashboard features rotating energy facts, an "Energy Events" panel with relevant energy news, and a helpful glossary of common energy terms used on the site. The design of the site was largely driven by the development and presentation of these various elements. Simple and clean, the site features a subtle green background with UNC's Wilson Library along with the school's Carolina blue colors and Old Well logo. The various bar graphs and diagrams echo these colors and unify the overall design. The primary development goal was to create a well-designed, usable interface to expose complicated energy usage data in a user-friendly way so that it could easily be read and analzyed. The application is entirely client-side and dependent on remote APIs for its data, and makes extensive use of HTML5, jQuery, and Backbone.js, with a remote REST API driving the whole thing. HighCharts JS is used to build the animated graphs, creating an interface that provides real-time and historical data of energy usage at the University. Also extremely useful for quickly reading data is the Campus Map feature of the site. Leveraging a Google Maps API, the Campus Map color codes the various campus buildings according to energy usage, with green buildings using the least amount of energy relative to the red buildings, which use the most. This representation of usage data also comes from the remote API, ensuring that the data is as current as anywhere else on the site.